This bright, colourful home includes a fully-equipped kitchen, 2 bedrooms (double bed /twin beds and an additional sofa bed in the living room), hot water shower, outdoor shower, washing machine, WIFI, secure parking, safe, fruit trees on site and it's fenced in, making it child and pet friendly. 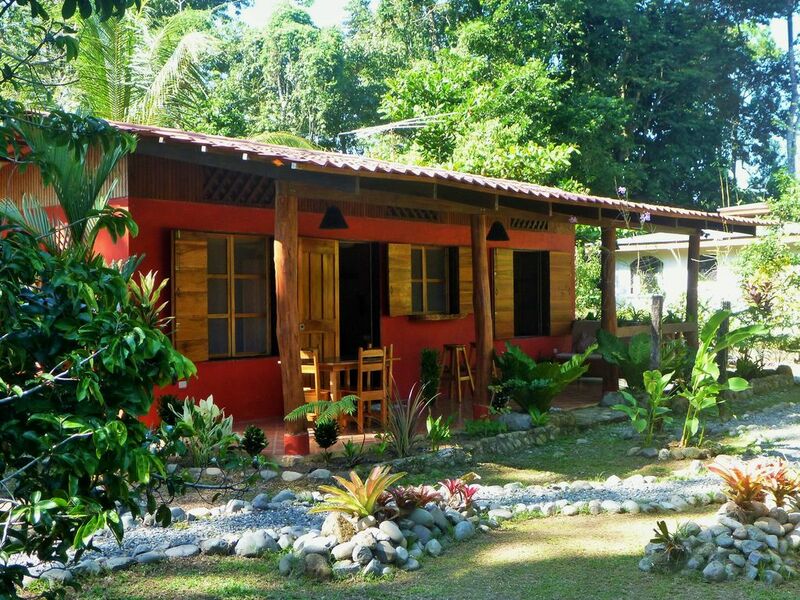 The house is located in the tranquil community of Playa Negra just 2km away from the bustling town of Puerto Viejo which features a variety of restaurants and shops. The beach is a 5 minute walk away. Also nearby are a grocery store and Banana Azul which overlooks the beach, a perfect spot for dinner or a drink. Alicia and Andrew live in Canada most of the year, their property manager Hernan will greet you and show you around when you arrive. He lives close by so if you need anything, he's a phone call away. We pay taxes to the government, so we charge 13% extra which is included in your total fee. If you love the sound of birds waking you in the AM, which we do, Casa Vida Loca is the place for you! We saw a pair of clay-colored thrushes working on a nest in a corner of the patio & many more colorful birds came by as well. The garden surrounding the house is colorful and lush...loved the tall orchids at the entry to the house. Very peaceful place to relax with all amenities we needed and walking distance to lovely Playa Negra. Some days waves were inviting, others a bit intimidating. Susana, the local host, was wonderful. She guided us and answered questions without being intrusive. We loved having a "home" away from the hub-bub of town—though also appreciated having it right near by. Sad to leave after getting so comfortable and look forward to coming again. Thanks for sharing your home—it was Pura Vida! The casita was homey, quiet and safe. We could hear the ocean, birds, frogs, and other critters. We cooked, rested, and slept well. It was like having our very own private jungle. Walking to the beach was a breeze. Most of all I thought Costa Ricans are friendly. It was a great location for us! Close to the beach and Banana Azul where you can get a cappuccino in the mornings. The beach is secluded and goes forever. We walked into Puerto Viejo via the beach in about 15 minutes. The sounds of the frogs and birds was lovely to drift off to sleep and to wake up to. Marge I really appreciate how fast you were in communicating with me and the good care you took of my house. We really enjoyed our time in Puerto Viejo and Alicias home is so lovely; perfect for my family (me, husband and kids 4 & 6 years old). Clean, comfortable, and just as described. Susana was there at arrival to show us around and provided tips about the beaches, restaurants, activities for the kids etc. She’s a gem! Nice balance of time exploring Puerto Viejo and relaxing at the house. We will return! Thanks so much for your kind words. I am very happy that you have a great experience at our house. I agree Susana is amazing! Beautiful cottage-like home steps from the beach! We had a fantastic time at Alicia's adorable little getaway home. It was secluded, yet close to everything. Proximity to Playa Negra was a perk, the nicest beach along the Puerto Viejo coast. The house itself has everything you could possible need, including a fully stocked kitchen and outdoor grill. We did a lot of cooking at the house and enjoyed eating at the outdoor dining area. A really gem in busy Puerto Viejo! Tip: renting bikes for only $5 per day made getting to and from town a breeze. I m so glad that you enjoyed our house, I agree with you about eating outside in our patio listening to beautiful frogs and birds. Karen, tahnks so much for your review. Hernan told me you were an excellent guest. I am glad that you enjoy the house and the weather was better than when you arrived. Hope you come back and send us other friends.